Many developers say that recipe animation, either employing stop-frame photography, line drawings or infographics, is the future of digital cooking instruction. 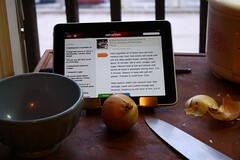 Video, on the other hand, while it can be valuable for bringing a personality into the kitchen, has several drawbacks. It is expensive to produce, and eats up precious memory. Because there is so much video in Baking With Dorie, its mere 24 recipes pushed the app to the maximum data size allowed by Apple in the iTunes store. In contrast, the app for “How to Cook Everything,” illustrated only with line drawings, holds 2,000 recipes. Why on earth do the videos actually need to be contained within the app? A well produced video seems so much more valuable to me than an animated line drawing, and it seems there simply must be an internet (dare I say cloud) based solution to the issue of onboard memory and app size limits. Regardless, despite some strong promise in teaching people how to cook via app... having quick and easy access to technique videos in the kitchen sounds great (I've stopped cooking to look up how to do something on YouTube many many times)... I'm still not planning on ditching my cookbooks any time soon.